Cake Tools! There are so many that you could literally spend $$$$$ on tools thinking you need them all. But in fact there is very little you really need when you first get started. And there is a whole heap of stuff you could end up buying and never using! This video walks you though what each of the main cake tools is for so that you can decide if you really need it or not. There are a few essentials you really will need and others that you can save until later to buy. Watch the video tutorial for more details and read further below for my list of "must haves". You may also want to watch this tutorial on Modelling Tools for Cake Makers. Watch the video for more detailed descriptions on each tool or see further below. ​These come in all shapes and sizes. If only getting one, have a nice big one which you can get in most UK cake shops. If they are harder to buy in your country, any large "non-stick" board works. On Amazon you can buy lined boards. Purchase: One of the cheapest suppliers is Culpitt who sell via Amazon here. A total must have if you want to work with fondant. These pins enable you to roll the fondant without it sticking to the pin. It is best to have two - 1 around 6 or 9 inches long and another around 20 inches long. Purchase: Amazon sell most sizes with the 20 inch being the most common here. 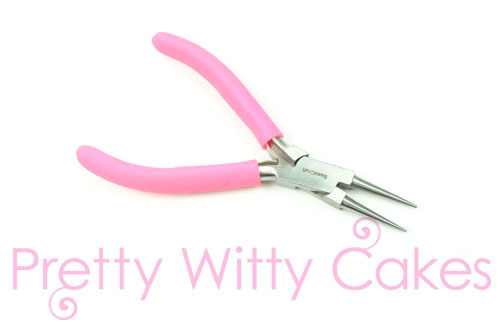 Small tip: If you can find one with handles it really helps as your wrists can ache if you roll a lot of fondant. If you are only going to get one, get a tilting turntable. When you first start, you can use a lazy Susan instead. The regular flat turntable is the next level up. The reason I like the tilting turntable is because you can tilt your cake up to work on it. This is especially useful if you paint on cakes. Purchase: Again you can get in most cake shops and on Amazon here. You will definitely need a carving knife but you will struggle using a long flat knife. Instead a long serrated knife makes a big difference and you will be able to cut off small amounts or cake with more control than a flat knife. For additional carving work, make sure you have a small serrated knife as well. Purchase: Kitchen Craft is a good supplier of these but any good kitchen shop. The best ones for super sharp-ness are Victorinox. Watch at 5: 22 mins into the video. In the early days you can substitute a paring knife for something else like a smoother, a scalpel and so on. This will save a bit of money. The paring knife is great for cutting fondant or the edge of a cake board where a serrated knife would be too sharp. Purchase: Any good kitchen shop will sell these. This is such a vital little tool. You can get them from any hardware shop and they will ensure that you get a level cake. This is important as often you won't notice your cake is on the wonk until you have finished and there is nothing more soul destroying that finishing then seeing your cake is leaning! Metal scrapers are vital for "crumb coating" your cake. It is a bit like plastering a wall. The tooler your metal scraper the better it is so if you are only buying one, get a tall one. You can also buy a right angle one and again you can use ones from tool hardware shops as long as you fully sterilise and only use for cake work. Purchase: Any good hardward shop will sell these. You can buy from cake stores but you will may more there for the same tool as you get in a hardware store. Smoothers are what you use to smooth the fondant on the top of cake. It is virtually impossible to get a smooth surface on a cake without them. You will need two of them for reasons described in the video (else you will end up with finger dents). I use FMM Smoothers which you can fins in most cake shops. You can also use acetate flexi smoothers for really getting very sharp edges. Many videos in the Pretty Witty Academy show you how this is done in a variety of different methods. Purchase: FMM Smoothers on Amazon on here. Acetate flexi smoothers from Squires kitchen oor Amazon here. A shaker is a really helpful as you will need to shake cornflour or icing sugar onto your board or work surface. The cost of the shaker is offset by the savings you will make from not over-using the cornflour or icing sugar. ​Purchase: The kitchen craft one is good value and works well. This is the one I use. You can buy on Amazon here. 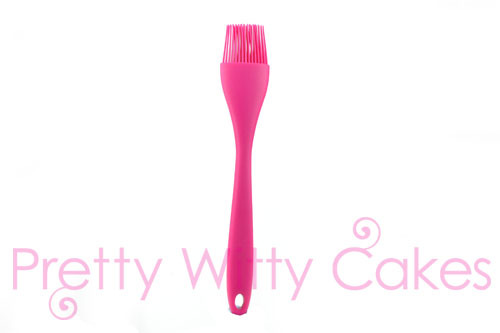 Any cake maker is going to need brushes. You can use normal sable hair art brushes. You will need one that is used for glue and then a selection for dust and colouring. It is often difficult to fully get the dusts out so better to have a set you use for different things. You also may need a large make up brush for dusting on large areas of dust (eg on wedding cakes). ​​Purchase: If you are just starting, sabel hair brushes are great. A big make up brush is also helpful and you can get from any chemist or make up shop. Other brushes you can get from any art shops. Spacers are good for beginners to help you roll out fondant so it is equal thickness. Once you have got more experience you will find you don't really use these. Purchase: You can buy in most cake shops or on amazon here. Dowels are a vital piece of equipment for any tiered cake. You use them to hold up the weight of the higher tiers so that your cake does not collape under its own weight. If you forget to use them, then you will find out after why they are so important! 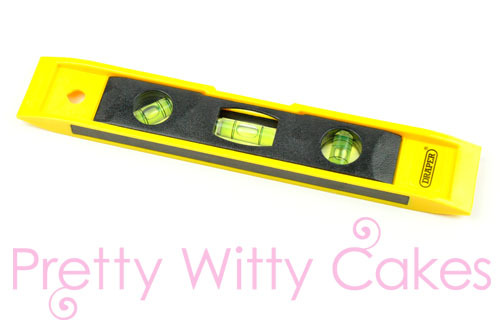 There are many tutorials inside the Pretty Witty Academy showing you how to properly use dowels as the precise use varies depending on the cake shape. Note that historically cake makers have used plastic straws as in the video but since plastic is something to avoid wooden dowels are becoming popular again. ​Purchase: You can buy in most cake shops or on amazon here. - Rainbow dusts have also become popular since this video was filmed. ​Always use colour paste gels rather than liquid ones. ​​Purchase: You can buy in all cake shops. Edible Tints are matt dust colours. Edible Lustres are shimmery. You need to be careful with these to ensure that whatever you are using is food safe. Edible tints are essential if you want to make sugar flowers. Edible lustres are less common but can be used for shimmers on cakes. Snowflake or a light cream work best. Note that Rolkem was questioned about whether their food dusts were food safe in 2018. Please check carefully with the supplier depending on which brand you buy. Palette knifes are used for a variety of things. Typically you will need one straight, one cranked and possibly a small one. Flat ones are usually used for icing (eg flat icing cupcakes). Cranked ones are great for getting things off your board. You will only need wire cutters and round nose pliers if you are planning to make lots of sugar flowers. You will need fairly small ones and you can buy them online. If you struggle to find them look in sewing shops or craft shops rather than cake shops. Cutters are the one thing you can go mad on and accidentally spend a fortune! You don't need many to start with when you start out making cakes. A set of 11 circular cutters like these Ateco ones will be so useful. We use these for all sorts of things from basic modelling to baking. They are a really good investment. I recommend the metal ones over the plastic ones. A foam pad is a really useful piece of equipment and vital if you are making sugar flowers. It will help with making the edges less sharp and more realistic on sugar flowers. A foam flower tray is a foam bumpy pad that is used for drying sugar flowers. Usually you end up with 3 or 4 of these. It is an essential piece of equipment if you want to learn to make simple sugar flowers. A soft tape measure for checking ribbon lengths is helpful. 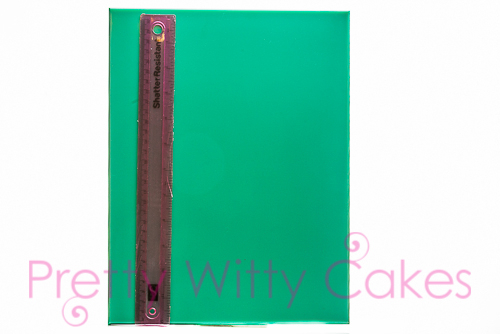 A metal ruler is also useful and ensure you buy one where the measurements start at the bottom of the cake rather than 5mm in like some rulers do. ​Purchase: Most stationary or sewing shops will sell these. For sticking on ribbon you would use one of these. A glue stick or double sided tape both work well with a glue stick being slightly easier to use. Edible glue is used for all sorts of things such as sticking on flowers or fondant characters. You can use water but it is not as stick. You can use royal icing for even stronger "glue". ​Purchase: Squires edible glue is here. A non essential but really useful cool is an ice cream scoop. This is used when you are making cupcakes and you want a really quick way to know that each cupcake has the same amount of batter in so they are all equal. ​​Purchase: The ones I use are from Kitchen Craft here. This is a really core piece of equipment. Most overns are not actually the heat they say they are at. So a little thermometre means you will get a more accurate bake. You are likely to already have one of these but in cake decorating you will typically use this for ganache work when you need to brush the full cake with colled boiled water. There are literally 1000s of cake tools and bits of equipment you could buy. The above list from the free tutorial are those which you are likely to find yourself using regularly and therefore worth investing in!